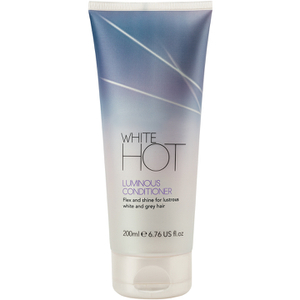 Catering specifically for natural gray and white hair, the Glorious Shampoo from White Hot works to cleanse hair and restore luminosity from root to tip. Best shampoo I’ve used. Tried lots of different shampoos, and this is the best. I have wavy, thick, coarse hair. I was hesitant to order shampoo from the U.K. when there are so many brands on the shelves. But, I had stopped coloring my hair and the description and reviews intrigued me. I love this shampoo! My hair has always been thick, coarse and dry but I couldn't believe the change using this shampoo and the conditioner. My stylist couldn't believe the change in the texture of my hair as we had tried so many products (even keratin) with no change. More than I'd like to pay but worth every penny!